Be the first to share your favorite memory, photo or story of Valerie. This memorial page is dedicated for family, friends and future generations to celebrate the life of their loved one. 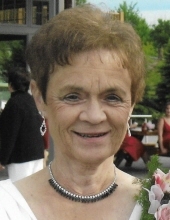 Valerie Adele Phelps, 82, of Lapeer, died Thursday November 15, 2018. She was born March 15, 1936 to parents James Ralph and Adele (Racine) Todd. Valerie married Charles E. Phelps on May 7, 1955. Mrs. Phelps worked for Kmart, Lapeer for 10 years. She enjoyed everything outside, especially; camping, walking and gardening. Above many things, Valerie loved her dogs, Rambo and Sadie. Mrs. Phelps is survived by her husband of 63 years: Charles, children: Cindy (Dan) Bollon; John (Cathy) Phelps; Diane (Shawn) Bashore; Michael (Jody) Phelps and Jeff (Carmela) Phelps all of Lapeer, x11 grandchildren, x18 great-grandchildren, siblings: Bob (Cher) Todd; Janet McRobb and Pam Nelson. She was preceded in death by her brother Jim Todd as well as her parents. On behalf of Valerie’s own wishes; the family has entrusted Muir Brothers Funeral Home, Lapeer with cremation. The family has scheduled a private service in the near future. "Email Address" would like to share the life celebration of Valerie Adele Phelps. Click on the "link" to go to share a favorite memory or leave a condolence message for the family.